The Japanese beetles were out in full force this year. Our beetle traps gathered hundreds each day. There are several methods of controlling Japanese beetles, and while each one has its merits, none of them work 100% by themselves. The reason for this is that you are dealing with the forces of nature here. A coordinated attack on several fronts is necessary to defeat this enemy but your primary weapon is vigilance. Your garden does not exist inside a bubble. It is exposed to all of the elements. You may do your best to control insects in your yard, but your neighbors, either next door or two blocks away, may not, and those insects will make their way into your garden. 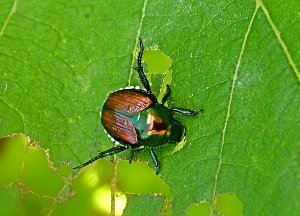 Understanding the life cycle of the Japanese beetle is important in controlling it. The adults that do the damage to above ground plants emerge in June and July. Like most insects their only interests at this point of their life are eating and mating. The beetles live for 30-45 days. The most intense beetle activity coincides with this stage of their life. Each female will lay 40 to 60 eggs during her lifespan. The eggs are laid in grassy areas where they hatch into grubs. It's at this stage of their life that they do the most damage to lawns. They feed on the roots of grasses and vegetable seedlings. Heavy infestations of grass will result in brown patches of dead grass that can easily be peeled back. The beetles overwinter in the grub stage, burrowing deeper as the soil cools. In the spring, they move back up into the root zone and continue feeding. Damage to the grass is not usually evident in the spring because the conditions are cooler and wetter and the grasses are actively growing. After 4- 6 weeks, they enter the pupa stage, and then emerge as adults. As mentioned before, your garden does not exist in a bubble. Since adult Japanese beetles can fly in from other areas, none of the controls are going to be totally effective. Work on controlling next years infestation should start in August and September. This is when the young grubs are most susceptible to chemical and biological agents. There are many chemical treatments that are effective against the grubs. There are two biological agents that are available to the homeowner for controlling grubs. Bacillus thuringiensis (BT) is a naturally occurring soil bacterium that organic gardeners should be familiar with. Milky spore is another. Both are applied to the lawn in the same way as chemicals and they both work in a similar fashion, infecting and killing the grubs. BT needs to be reapplied and has a window of effectiveness equal to the chemicals. Milky spore will build up in the soil over a period of 2-4 years because when the grubs die, they release more spores into the soil. There are also nematodes that are available that feed on the grubs. Heterorhabditis bacteriophora is one species of nematode that is both effective and easily available. Controlling these grubs in your lawn helps prevent damage from other animals. Moles are attracted to lawns with heavy grub infestations. They love these little delicacies and in the process they will happily dig holes all over the place. Skunks are also attracted to lawns with dead patches of grass. They know what's underneath and will dig those areas up to find their dinner. The traps we placed last year were discovered by the skunks and torn open each night and the days catch was devoured, much to the delight of the skunks. We finally resorted to bringing them in and emptying them every night. In June, the use of traps, when placed properly, can help control the active adult beetles. Most traps use a combination of pheromones and floral scents to attract the insects. The traps should be placed 20-40 feet downwind of the areas that you want to protect in order to intercept the adult beetles that are attracted from other areas. If this isn't possible, try to locate the traps as far away as possible from the areas needing protection. We have found that the traps work best in full sun because the warmth of the sun helps to release the scents. If you cannot place the traps far enough away from the plants that you want to protect, its best not to use them at all because by their very nature, they attract the beetles. Another issue we've discovered with traps is that they attract skunks. These nocturnal creatures will tear the collection bags open to eat the insects. We started taking the traps inside in the evening to discourage them. There are also insecticide sprays that you can use on your plants to kill or discourage the insects. Sprays need to be reapplied often to be of any use. If you use these, be sure to follow the label directions, especially when using on edible plants. Physical barriers such as fine mesh netting or cheesecloth can be used to protect your plants and the insects can also be picked off by hand and dropped into soapy water to kill them. In short, controlling Japanese beetles is a year around job, by using the proper methods at the right time; you can suppress, but not eliminate this destructive pest.